Learning that you need to collimate the mirrors of a reflector telescope can come as a shock if you've never owned on before. Reflectors (Newtonian and Dobsonian) work by collecting light with a primary mirror at one end of the telescope tube. In the diagram, the primary mirror is the large blue area on the right. This light is reflected up to the secondary mirror, mounted near the opening of the telescope (small blue rectangle on left of picture). 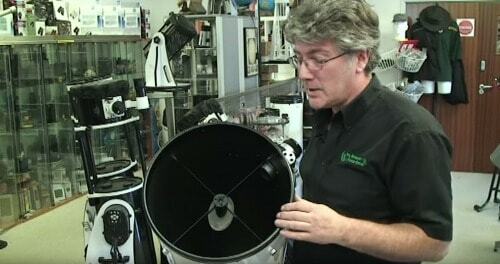 This secondary mirror diverts the light off 90° to the eyepiece mounted on the side of the telescope (shown at the top of the picture, where the red line is). 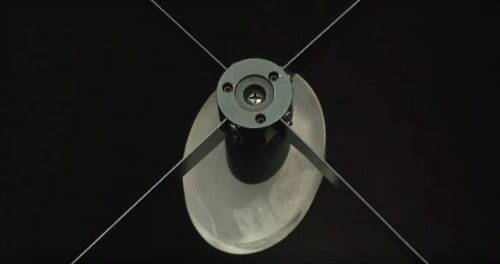 To achieve peak performance with your reflector, the primary and secondary mirrors must align with each other, and the secondary mirror with the eyepiece. Over time, with movement and the odd knock and bump, the alignment of your telescope's mirrors will get worse. 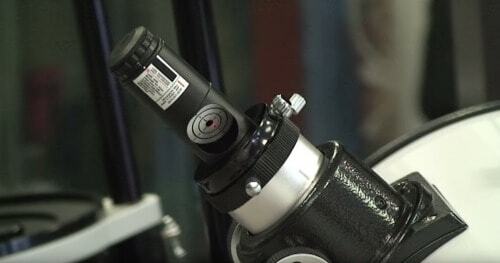 Collimation is the process of putting the mirrors of a reflector telescope back in alignment. If you've never done this before, don't worry!! 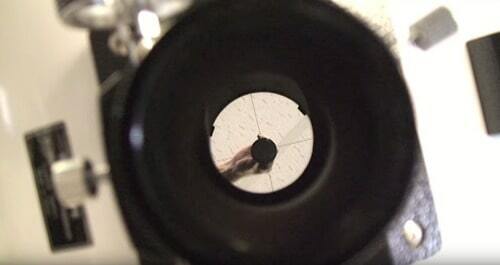 Collimation is much easier than you've read about. To prove it, we've grabbed the best collimating video on YouTube and split it into eight simple steps. 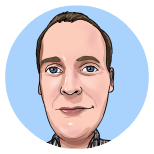 Our added instructions will take you from collimation virgin to expert. About 55 seconds into the video, the guys begin to mess around with the mirrors. They make both the primary and secondary so distorted that you can be confident yours will never be that bad! At 1:45, it's time to start collimating the telescope. The tools Ralph has ready to use are an Allen key (hex key) and Phillip's screwdriver. Both are needed to adjust the telescope's secondary mirror. ​Between steps two and three, Ralph is seen adjusting the secondary by hand. You can safely ignore this part - your secondary mirror will never be that badly aligned! We're 2:30 into the video and it's time to make our first adjustments. These are to the secondary mirror. 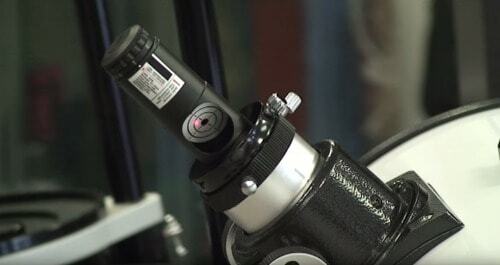 Look through the draw tube without an eyepiece in it. You should be able to see the secondary mirror reflected in the primary. Use your hex keys to adjust two of the three screws on the secondary mirror. As Ralph says, "you don't make a stool level by adjusting all three legs. You just change two of them to match the third." At 3:03 on the film we're introduced to the laser collimator. This special little tool takes away all the pain of collimation. We'll use this first to align the secondary with the center of the primary and then to align the image of the primary with the secondary mirror. When you put the laser collimator into the draw tube in place of an eyepiece, make sure its 'target' is facing towards the primary mirror. I.e. 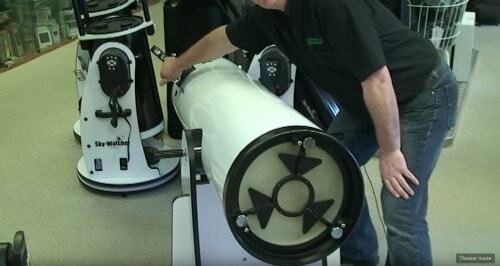 the 'target' should be pointing towards the back end of the telescope. You can see this being done at 3 minutes and 37 seconds into the video. Lock the laser collimator and focuser in place for the rest of the collimation procedure. It's important that the laser collimator is rigid and square whilst you make mirror adjustments. This picture, taken just after the 4-minute mark, shows how far out of alignment the secondary mirror is. That red laser dot should be in the middle of the black ring on the primary mirror. (Your primary mirror probably has a centre ring on it from the manufacturer. However, if it doesn't, this page shows you how to easily put one there yourself). At 4:10, Ralph begins to adjust the secondary mirror. Remember, you only need adjust two of the three screws to get that little laser light into the central ring. 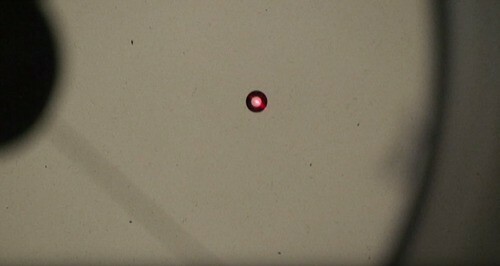 When it's correctly aligned, the laser dot will be exactly in the centre of your primary mirror. You can make adjusting your secondary mirror even easier by buying a set of 'Bob's Knobs' (Amazon.com link). When you pick the right set for your scope, they fit in place of the hex screws and can be adjusted by hand instead of using a key. The advantage of this is there's no risk of dropping your tool into the telescope and damaging the primary mirror. It's also a lot less tricky than using the hex key! At 4:42 it's time to move on to the primary mirror. 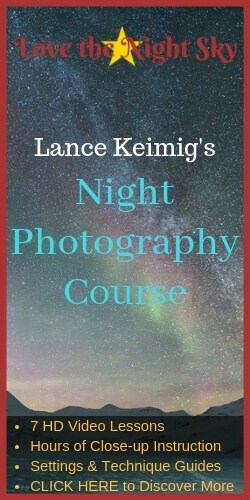 We need to make sure it is accurately sending reflected starlight to the secondary mirror and your eyepiece. In the picture, you can see the three large adjusting screws and, at their side, the smaller locking screws. The locking screws stop the adjusting screws from being moved accidentally. At this point (and in this picture - click to zoom), you can see why it's important to make sure the laser collimator's target faces the primary mirror. 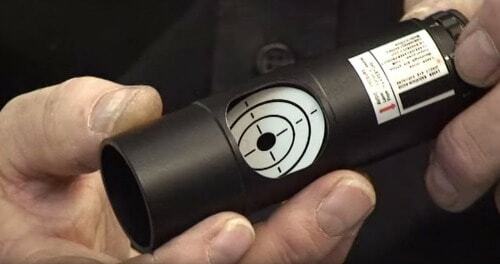 Assuming your telescope only needs a small amount of adjusting, you should be able to see the laser already on the target when you start. (If you can't, follow the advice at 5:25). Starting at 5:37, you can see the laser appear on the target. 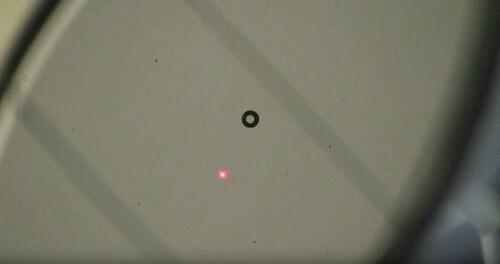 It's now a process of gentle, small turns of the adjusting screws to move the laser to the center of the target. At this stage, the best advice is to use a little trial and error ​with the three adjusting screws. Try moving each of them a little bit to see which screw turned in which direction moves the laser light closer to the centre of the target. When the laser light disappears into the centre hole of the target, you have successfully collimated your primary mirror! As you tighten the locking screws, you may find that the laser pops back out of the target's centre, just like happens to Ralph at 5:55 in the video. If that happens, all you need do is some very small tweaks to the adjusting screws to finish the collimation off. You can see from the 8 simple steps above, there is no need to be afraid of collimation! 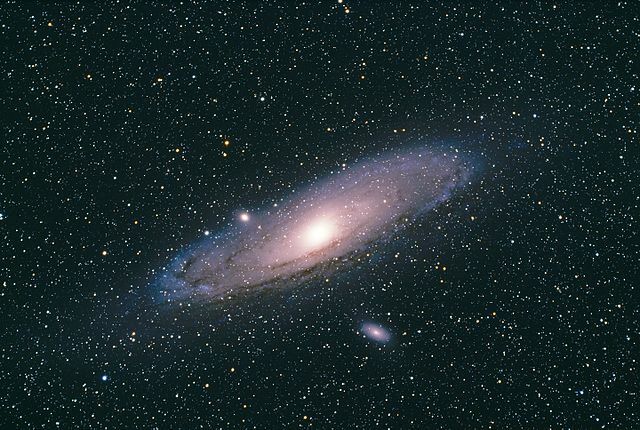 Your telescope is (probably) already quite well collimated. If so, it shouldn't take more than a few minutes to make your scope's alignment perfect. If you want to have a go for yourself, try grabbing a set of Bob's Knobs and a ​laser collimator from Amazon and get cracking. 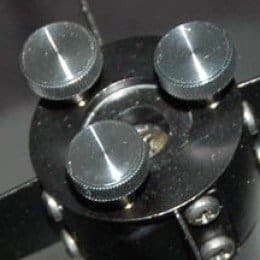 By the way, if you are still having viewing problems with your telescope after collimation, it's possible that the laser collimator itself is out of alignment.